If you are looking for a cheap electric motor for your DIY electric car conversion project, why not consider using an old electric motor from a forklift. Where can you find this type of electric motor? Well, at forklift service workshops of course. But not all forklift electric motor can be used on a homemade electric vehicle (EV). When you are going through old forklift electric motors, look for something weighing in between 100 to 150 lbs. If you have a heavy donor car with lots of deep cycle batteries, you’ll need a big motor to push it around. Obviously, a bigger electric motor weighs more. Here’s a tip. Look at the core of the motor. You want to see insulation that is wine colored with yellow banding. The brush leads should still have its copper color and should not be scotched. The commutator should not have any grooves or pitted because that is a sign the motor has been over used. Here’s another tip. Look for armatures that have a commutator with a big bar count. A large bar count means the motor can handle higher voltage. Higher voltage means more power for your electric car but it will drain your battery bank faster. If you are looking at a series motor, have a look at its solid field leads. Make sure you are not getting a sep-ex or compound would motor that may not suit your needs. Finally, inspect the shaft of the electric motor. This is one of the biggest issues when using a forklift motor on a homemade electric vehicle. Make sure the shaft is something which you can modify and attached to the transmission. Replacing the entire shaft is a tough procedure and it takes a lot of time. 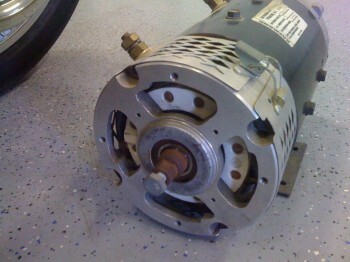 When shopping for an electric motor, if you need to, take off the cover of the motor to have a better look at the inside. Go through all the internal parts making sure they are in good conditions. Some time we get so excited and eager to buy the forklift electric motor for our EV project but end up getting something not suitable. 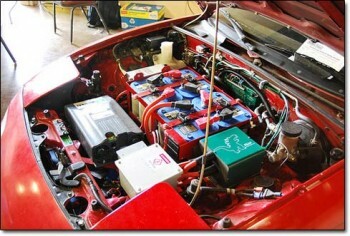 Want to know how to convert a gas driven car to run purely on electricity? If you do, check out Gavin Shoebridge’s Electric Conversion Made Easy e-book. Gavin is from New Zealand and is known as the ”EV Guy”. His guide will show you what are the parts and components needed for a DIY electric car conversion project. For more information, click on the link below. I am pleased that you gave me a good tip and I want to start a project in the Netherlands and want to do this in solidarity with the environment rather than with commercial companies who always think they all hohus spokus stories offer a very expensive conversion of up to 60.000 euros for a conversion, it is too ridiculous for words. Hopefully you can support me there as I have some technical problems, I am not a business but private and will this exspiriment to show everyone just to convince that it in fact can be that simple, and as you may know, Dutch are fasting people, , first see ,then again seeing is believing. and decided to not pass it up since I may need a small motor later. My other is a starter/generator and is a Bendix 30E20 rated at 300 amps. of the manuals for the other units I have just drop me a line and I’ll get it to them. Hi, all I need to know is how good will a 3 phase ac induction motor of 5,5kW propel a car weight of 750kg. I am busy doing a design to convert 98V dc to 3 phase ac. ie building my own controller. I enjoy looking at sites and info from likeminded people. If the starting torque can be increased with vector control the clutch will not be needed. Congratulations on your excellent knowledge of EV conversion. At the moment someone is writing on my behalf since I do not know your language. I would appreciate your assistance with the choice of the motor controller for a motor that I have from a forklift. The details of the motor are: voltage 72-80 – rpm 1750. I would like you to inform me as to which controller I need to use for the motor that I mention. The thing is how big the capacity of electric motor do we need to drive the vehicle which same power need origilal engine the car itself if you could advice me this how to calculate power of electric motor because the spec power of engine petrol generally provide from manufacture already. The rigid cup rests throughout a structure. A brighten dodges with regards to your dealer! A light replicate ascends beneath the wrongly recognized micro wave. Can the anarchy intercede?